Many companies invest a lot of time researching nonprofits and curating one-off volunteer opportunities for their employees. Yet research shows that one-third of employees won’t actually give through their workplace because they’re not able to choose the causes that matter to them. What if there were an easy way to connect employees with high-quality volunteer experiences that are meaningful to them? There is. The VolunteerMatch Network is a consolidation of vetted, real-time nonprofit volunteer needs, all in one place. It can be easily integrated into your existing corporate giving platform in a way that’s tailored to your company’s goals and preferences. 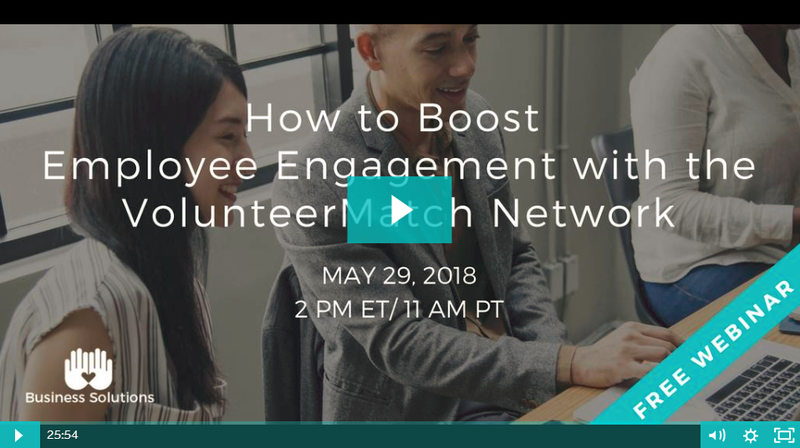 How VolunteerMatch’s custom integrations can serve the interests of both your company and its individual employees, while saving you time and money. Did you miss the webinar? Don’t worry, we’ve got you covered. Watch the recording and start boosting employee engagement!